The burst of elephant evolution during the Pleistocene, driven in part by the fluctuating glacial-interglacial climate, was to culminate in rapid extinction of the proboscideans under the possible influence of the same factor. Close to the end of the Pleistocene, 10,000 years ago, the mammoths of Eurasia and North America, the mastodons of North America, and the gomphotheres of South America made a sudden exit. Although the extinction of the mammoths and of the mastodons are the events best known to the public, several other proboscideans also disappeared at indeterminate periods during the Pleistocene. Deinotherium made a quiet exit in Africa during the middle Pleistocene. Likewise, Stegodon became extinct in Southeast Asia, and several species of Elephas became extinct in Eurasia and Africa during the Pleistocene. The extinctions near the end of the Pleistocene have evoked the greatest interest and have been studied in some detail as these were rapid, well represented in the fossil record, and contemporaneous with prehistoric humans. Not only the proboscideans, but also a host of the larger mammals (weighing more than 40 kg) became extinct during late Pleistocene times, beginning about 40,000 years ago. North America lost about 40 species or 70% of the larger mammals, South America lost 75%, while Australia was devastated by a 90% loss. Unlike the previous "major extinction" during Pliocene times, the late Pleistocene event was notable for the selective loss of the larger mammals. Of all mammals heavier than 5 kg, about 50% of genera were lost worldwide in the latter event. Geographical variations can be discerned in the timing of these extinctions. In North and South America, the majority of extinctions, including those of the mammoths and the mastodonts, are clustered around 11,000 years ago, while in Europe and over most of Siberia, this seems to have occurred about a thousand years earlier. The southernmost populations of the woolly mammoth in Eurasia, such as those in China, died out earlier, around 20,000 years ago. A gradual shrinkage of the range of mammoths northward is thus indicated in Eurasia, but more recent evidence suggests a complex picture, including fragmentation of the range into many small populations. The Australian extinctions of mammals began as early as 30,000 years ago. Explanations for the late Pleistocene extinctions must thus account not only for the loss of a host of species other than the proboscideans, but also for this geographical variation in timing. Climate change and associated environmental changes probably explain the earlier major extinctions of mammals in the geological record, and it is true that the late Pleistocene was a period of significant climatic fluctuation. The association of prehistoric human artifacts with fossil proboscideans at some sites, however, raises the possibility that hunting could have been a major factor in these extinctions. The proponents of climate change as the cause of the late Pleistocene extinctions usually relate these to proximate mechanisms, such as vegetational change and associated shifts in diet, disruption of reproductive cycles, or even a "coevolutionary disequilibrium" resulting from break-up of previous associations of species. The late Pleistocene was indeed a period of changing and unstable climate. Beginning from about 16,000 years ago, the earth warmed, and the ice sheets retreated over a large area of the Northern Hemisphere. Around 11,000 years ago, there was a sudden reversal to cold conditions for a short period (the so-called Younger Dryas) before the warming trend continued into the early Holocene. Some of these changes seem to have occurred with unprecedented rapidity. For instance, there are suggestions that the temperature may have soared by 6°C within 10-20 years around 13,000 years ago. Such an increase would have been even greater than climate model projections for the twenty-first century as a result of human-induced greenhouse gas increases. In spite of such climatic instability, a possible direct impact of the weather on large mammals has not generally found favor among paleontologists. It is believed that even woolly mammoths, with their thick fur coats, could survive under warmer conditions by retreating to their cooler northern refugia. The Columbian mammoth ranged as far south as Mexico and thus could not have been dependent on only cold conditions. David Webb, one of the chief proponents of the climate change hypothesis, has described six major extinction pulses in North American mammals over the past 10 My. The late Pleistocene episode, the last of these six events, is only the second most severe in its loss of mammalian genera (the most severe being the Pliocene event of about 4.5 My ago). Climate change effects are harsher at higher latitudes. Webb argues that one test of the climate hypothesis is to look for patterns in extinction across a latitudinal gradient. The latitudinal pattern of extinction-survival in North America is in conformity with this expectation. Webb proposed two fundamentally different mechanisms for climate-related extinctions, one resulting from environmental stress and the other from biological interactions of new species assemblages following migrations. Several paleontologists have explored these and other climate-related themes. The simplest proximate causation linked to climate change is a change in the vegetation patterns. However, it is not an easy task to reconstruct precisely the vegetational changes over large landscapes, even for a relatively recent period. 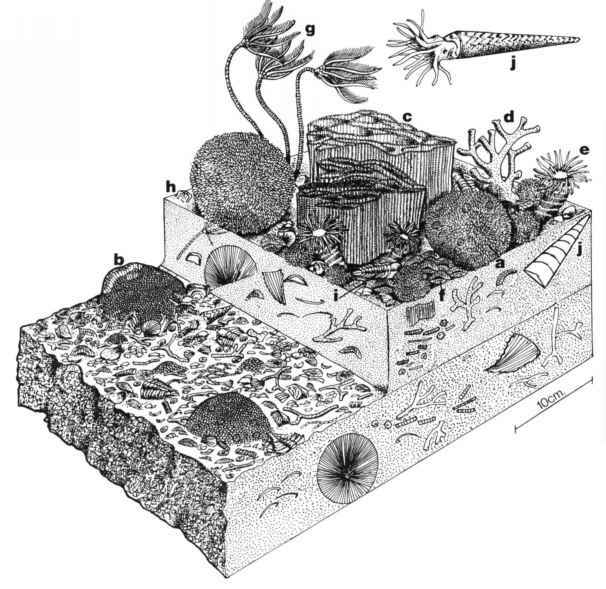 One problem is that our present-day definitions of vegetation into grassland, woodland, savanna, tundra, and so on do not fit the vegetational patterns of the Pleistocene. The evidence suggests that each of these vegetational communities, or their analogs, was more diverse during the Pleistocene. An example is the extensive dry northern grassland, termed the "mammoth steppe," which does not have a modern equivalent. Further, a more complex mosaic of grassland and woodland communities also existed at that time in northern latitudes. This can perhaps be traced to a longer and more varied growth season. All this changed with the warming trend after the last peak glaciation. Seasonality seems to have become more pronounced with a reduction in growing season. The warmer, moister climate encouraged the spread of forest into the vast expanse of steppe-like vegetation that had supported the mammoths. The greater seasonality actually increased snow cover. This, along with melting water from ice sheets, seems to have created the poor tundra vegetation of the far north. Neither the nutrient-poor, slow-growing tundra plants nor the coniferous forests to the south could support mammoths used to a diet of more nutritious grasses and herbs. Picking up the threads of vegetational change, Dale Guthrie has woven a more complex theory of extinctions that links herbivore feeding strategies with changes in plant nutrients and chemical defenses. His basic arguments are as follows. Herbivorous mammals are adapted to different diets in terms of plant type (browse versus graze), nutrient content (structural carbohydrates, protein content, etc. ), and the nature of plant antiherbivore defenses (tannins, alkaloids, etc.) based on gut anatomy (ruminant versus nonruminant) and body size (see chapter 5). A shortening of the growing season and increased latitudinal zona-tion of vegetation types and decreased plant diversity would have changed the herbivore-dietary equations. Not only could the herbivores have found it diffi cult to obtain the correct mix of nutrients, they also could have been unable to cope with new combinations of plant chemical defenses encountered in the altered habitats. These changes were more likely to affect larger, nonruminant mammals such as the proboscideans. The fossil record shows that virtually all the larger monogastric (nonruminant) grazers and browsers became extinct by the end of the Pleistocene. A more direct effect of the shorter growing season and increased seasonal-ity could have been a disruption in a mammal's ability to synchronize its reproductive cycle with the seasonal availability of resources. This argument, championed by Richard Kiltie, links the possible changes in gestation times resulting from changes in seasonality to a lowered long-term reproductive output and eventual extinction of populations. Here again, larger mammals such as proboscideans with gestation periods longer than 1 year were less likely to be able to adapt to a changing climate. The idea that humans may have caused the extinction of certain mammals through hunting first gained credence during the mid-nineteenth century. Jacques Boucher de Perthes, a French civil servant, uncovered the bones of several Pleistocene mammals, including the woolly mammoth, along with human artifacts in the Somme River Valley (see Martin and Klein 1984, pp. 3 and 25). It took a while, however, for the leading naturalists of his time to recognize the significance of his discoveries. In recent times, Paul Martin has been the foremost proponent of the hunting hypothesis. His arguments are based on the association of human artifacts, including hunting tools, with proboscidean remains at several sites in North America as well as a computer-based model simulating the hunting of megafauna concurrent with population expansion of the hunters. Although the exact timing of arrival of humans in the North American continent is controversial, it is believed that small bands of Paleolithic people from Asia crossed into Alaska through the land bridge existing during late glacial times (about 12,000 years ago) in Beringia. These Paleoindians or "Clo-vis hunters" (the term is derived from Clovis, New Mexico) used characteristic fluted stone spearpoints hafted into long shafts (fig. 1.8). These characteristic Clovis points are associated with mammoth remains at fossil sites across North America, especially in the arid Southwest, only from about 11,500 to 11,000 years ago. 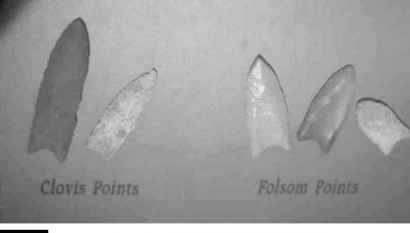 They are then abruptly replaced by different stone points of the Folsom culture associated with smaller animal remains. The most dramatic example of overkill or "blitzkrieg" begins with a hypothetical band of 100 Paleoindians located at Edmonton, Alberta, Canada, around 11,500 years ago. The computer model of James Mosimann and Paul Martin (actually based on an earlier model of the Russian scientist M. I. Budyko) then simulates the population of hunters increasing exponentially, hunting the megafauna wastefully, and advancing along a broad "front" southeastward to the Gulf of Mexico. doubling time of 20 years (the actual long-term doubling time is 30 years or 2.4% growth per annum) of the hunters, who take an average of 13 animal units (1 unit equals 450 kg biomass) per person per year, wasting half the meat. If mammoth and mastodon were preferred prey, hunters increasing at a much lower rate could still wipe out a hypothetical population of 3.3 million proboscideans in about 500 years. The Mosimann-Martin model demonstrated that it was entirely plausible for these hunters to wipe out 100 million large animals over 3 million square miles (about 7.5 million km ) as the hunters increased to a population of 300,000 within 300 years. During this short period, many species of mammals were hunted to extinction—the blitzkrieg allows no time for these animals to adapt to such an effective predator. Only such rapid extirpation times are consistent with the radiocarbon dates of mammoth kill sites across the continent. The argument of blitzkrieg is that the killing spanned such a short time that little evidence has been preserved in fossil sites. There have been several criticisms of both the climate change and the human overkill hypotheses as causes of late Pleistocene extinction of megafauna. A major objection to the climate change theory is that the mammoths and mastodons survived through a number of other Ice Age cycles during the Pleistocene, including one transition that may have been more severe than the recent event. Why did these and other larger mammals die out only at the end of the last glaciation? Arguments that the last climatic warming was the most severe or that the response of the vegetation this time was the most unfavorable to the herbivores are not yet backed by hard evidence. If climatic and vegeta-tional change had forced proboscideans to alter their diets drastically, it should be possible to determine this directly from preserved food remains and indirectly from stable carbon isotopes in fossil bone or tooth over a time sequence. The last method can distinguish between a diet of C3 plants (browse) and a diet of C4 plants (warm season or tropical grasses), although the C4 plant type would have been scarce in the cooler northern latitudes (see chapter 5). As yet, few details are available from analyses of plant remains in mammoths or mastodons over a time period. One isotopic study by P. L. Koch of late Pleistocene mammoth and mastodon from the Great Lakes region indicates a near 100% C3 diet. Thure Cerling and associates found that Mammuthus in the more southerly latitudes of Florida, Texas, and Arizona had a predominantly C4 plant diet, while Mammut from the same locations consumed C3 plants preferentially. Both had a mainly C3 diet in the more northerly Idaho. Clearly, more work needs to be done before dietary changes, if any, and their significance in the extinction process become clearer. Objections to the overkill hypothesis are even stronger. A computer-based model does not prove that hunters across three continents behaved in a manner that wiped out their teeming megafauna within a few hundred or a couple of thousand years. While it is not disputed that late Pleistocene people hunted mammoths, perhaps even commonly in places, there are few sites where there is incontrovertible evidence of hunting. Of the dozen or more sites in the United States where Clovis spearpoints have been found along with mammoth (or mastodon) remains, only at one or two sites (such as Naco, Arizona) is there clear evidence that mammoths were actually hunted. The evidence for hunting at other sites is more circumstantial or absent. In many instances, the association of spearpoints and proboscidean bones may merely indicate the scavenging or butchering of dead or dying animals. The evidence for regular mammoth hunting in Eurasia is even weaker. The large Paleolithic dwelling sites constructed from ivory, bone, and skulls of mammoths, as well as remains of other creatures, uncovered in Central and Eastern Europe are more likely to have been collected from naturally dead animals and not the result of overkill. Indeed, some of these sites may have been occupied over several centuries. There are clear indications of mammoth hunting in the Jersey Islands in the English Channel and of the hunting of the straight-tusked elephant, Elephas antiquus, at the Lehringen site in Germany, but these date to the middle Pleistocene. Siberia, a key mammoth region, was only very sparsely populated prior to the Holocene. In short, prehistoric people did hunt proboscideans, but they also scavenged carcasses for meat or butchered bones for marrow and collected bones, tusks, and hide for their dwellings. The crucial question is whether they killed proboscideans as well as a variety of other mammals at a rate that triggered the mass extinction of the late Pleistocene. Studies of continental hunting societies indicate that they did not usually hunt their prey to extinction. The subsistence base of hunters during the Pleistocene and Holocene was much broader than the largest herbivores; in fact, medium-size animals seemed to be preferred. To be fair to the Mosimann-Martin model, further simulations by Stephen Whittington and Bennett Dyke that incorporated lower human densities and prey offtake, while discarding the concept of a "front," still indicate that overkill is a possibility. They believe that M. I. Budyko's original model without the rapidly advancing front actually makes a better argument for the human overkill hypothesis. A theory of humans as the cause of the Pleistocene mammalian extinctions but not through hunting may seem to be very radical. This is precisely what Ross MacPhee and Preston Marx have proposed—a "hyperdisease" hypothesis in which migrating human populations spread lethal pathogens during their first contact with the animal species encountered. This is similar in its features to Paul Martin's blitzkrieg theory with a crucial difference in the causality. Entire populations of mammalian species succumbed rapidly to new pathogens for which they had no immunity. The much longer coexistence of humans and animals in Africa, the cradle of human evolution, and parts of Eurasia also meant that the faunas here were resistant. Although an attractive hypothesis, this is yet to be backed by evidence. A major problem is to demonstrate that a few pathogen species could infect a host of mammalian species and spread over continental scales to cause population extinctions. Using genetic (DNA) sequences from known pathogens that show characteristics of hyperdisease, a search is on among fossil specimens to identify ancient pathogens. Perhaps the strongest argument in favor of a human role in the Pleistocene extinctions is the increasing evidence for the disappearance of megafauna at different locations and at various times, coinciding with the first arrival of humans. Thus, the bird Genyornis newtoni, which was double the size of a modern emu, became extinct in Australia around 50,000 years ago (when climate change cannot be invoked) or only a few thousand years after the first arrival of humans on the continent. Ground sloths became extinct across North America during the late Pleistocene but survived in Cuba until 6,000 years ago, around the time of human arrival. More recently, the island of Madagascar experienced a major episode of extinction after humans reached there about 2,000 years ago. We can find other such examples of vertebrate extinction around the globe. Other interesting approaches using life history theory have been taken to examine proboscidean fossil assemblages for evidence of climate change or hunting as the cause of extinction. Fundamental differences in life history traits of populations that have died out due to environmental stress as opposed to hunting can be expected. An elephant population declining from climatic and associated vegetational change could be expected to show decreased growth in body size, increased age of sexual maturity, and decreased fecundity. This would translate into an age structure, preserved in the fossil record, with a relative predominance of older individuals. Analogies can be drawn with modern elephant populations, as in parts of East Africa, that have shown such traits (see chapter 7). Some evidence for the climate/vegetation hypothesis is seen not only in the reduced body size of the mammoths of Wrangel, which may be explained purely as the effect of insularity, but also to a lesser extent in the mainland populations of the late Pleistocene. By contrast, a population that has been heavily hunted would show the opposite life history characteristics. Daniel Fisher has been examining in detail, using innovative techniques such as tusk growth patterns, the life history traits of fossil American mastodon assemblages. The preliminary data do not indicate mastodon populations suffering from severe environmental stress, but rather those of normal productive populations. Larger fossil samples across various sites have to be examined before any conclusions can be drawn. There have also been attempts to incorporate both climate change and hunting in a synthetic theory of late Pleistocene extinctions. This recognizes that climate change played an important role, but that hunting by people may have been the last straw in the extinction of the larger mammals, such as mammoths and mastodons. Gary Haynes has argued, for instance, that proboscideans subject to environmental stress could have congregated around water sources, much like African elephants do in times of drought, where they would have been easy prey for hunters. He proposed that "humans opportunistically spread their worldwide range in northern regions only after they had found a resource (mammoths) that was becoming more and more vulnerable because of environmental stress." According to him, "A sweeping conclusion that would indisputably pin the blame for proboscidean extinction on Clovis hunters would be a literary triumph but a scientific impossibility. . . . Clovis hunters perhaps made an already bad situation worse for megamammals: While climatic changes were driving proboscideans to die off, the added stress of Clovis hunting drove them to die out" (pp. 316-317). A crucial question is, Why were the megafauna the most vulnerable during the late Pleistocene extinctions? Whether it was because of climate change or hunting or any other related factors, the relatively low population sizes and slow demographic response of the larger mammals would have rendered them more vulnerable to extinction. Picking up the threads of extinction of the larger herbivores, Norman Owen-Smith proposed that a host of carnivores, smaller herbivores, and other vertebrates that had coexisted with the megafauna now hurtled down the path to extinction. The megaherbivores were "keystone" species that modified the vegetation substantially, facilitating the survival of smaller mammals. Extinction of these keystone species triggered the decline of a host of smaller species. The curtains had fallen decisively for the extraordinarily diverse mammalian fauna of the Pleistocene, and humans were at least in part responsible for this collapse.